No, as of now you cannot edit the product quantity directly in the invoice. However, you can delete the generated invoice, modify the invoice quantity and then re-generate it. Go to Orders domain, select All Orders tab. You can identify the current status of the orders on basis of the dot marks present. Green dot marks indicate that particular status process complete. 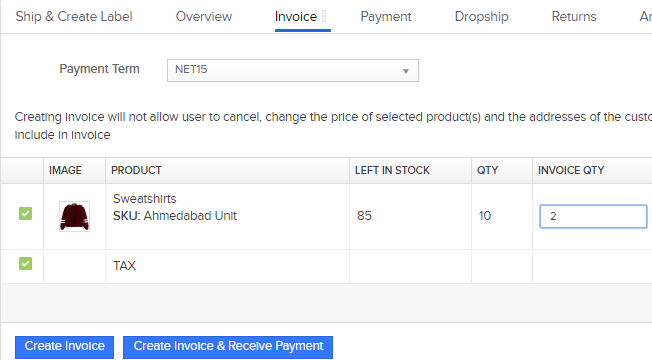 Select the order for which you wish to edit the invoice quantity. Note: You need to check whether the order is confirmed prior to modifying its invoice quantity. All sales orders can be processed only after they are confirmed. Also since you are trying to edit an invoice, it is understood that your order is already invoiced. After you select an order, you will see your invoice generated in the invoice tab. Go to Actions and click on Delete. 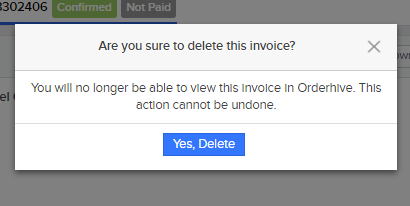 A popup window will open prompting you to confirm whether you want to proceed with deletion of the selected invoice. Note: Invoices once deleted cannot be retrieved back again. This action cannot be undone. Click on Yes, Delete. 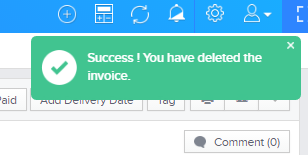 Orderhive will now display a message for the successful deletion of the selected invoice. You can now modify the invoice quantity and click Create Invoice. You will find a new invoice generated with the quantity that you have entered.